Disclosed is a mobile communication device, comprising a transmitter and a receiver unit, a sensor to register the movements made with the device and a processor unit to store and process the movements made with the device. The processor unit especially recognizes handwritten inputs and converts them into preset commands. A user authenticates his or her identity with the device by means of his or her signature. Handwritten telephone numbers are directly dialed by the device. The invention relates to a device for mobile communication. A gyro sensor is known from . This is a sensor for receiving a movement, in particular the acceleration at which the movement is executed. A pressure sensor is preferably embodied as a switch sensor, the contact is closed when a predetermined pressure is applied. Signature are not different by more than a predetermined distance measure. Similarly method for recognizing handwritten input characters are known. Handwriting recognition is done in many commercially available hand-held computers for managing and organizing appointments and / or addresses. A device for mobile communication (mobile phone or mobile phone) is well known. For authentication, the user enters an identification number (PIN = Personal Identification Nu over) on a phone keypad. It is a disadvantage that the user Must Remember the identification number and that anyone who comes into possession of the identification number can use your mobile phone. 2 The object of the invention is to provide a device for mobile communication, with a comfortable operation is made possible. This object is achieved according to the features of the independent claim. There is provided an apparatus for mobile communication having a transmitting and receiving unit for performing mobile communication. Further, a first sensor is provided, which receives sensor with the device by movement is required. Also, the apparatus comprises a processor unit for storing and processing carried out with the device movement. Device provides a signature. The signature is received from the first sensor and compared by the processor unit with a reference signature. With a known method for signature verification ensures that the work done with the device signature authenticates the authorized user. The handling of the apparatus for mobile communication as a pin to which a signature is made, corresponds to a natural, well-known to the user operation that meets high level of acceptance. In this case, be peculiar characteristics for the user, that is, characteristics of his signature, used for authentication. Also, the user must memorize identification number (PIN). Thus a natural and secure method of user authentication is enabled by authentication by signature. 3 is a development that the first sensor is a gyro sensor or a trackball. A trackball is an input device, which preferably consists of a rotatably mounted ball, wherein the rotation of the ball is converted via suitable sensor into a usable by a computer movement. Also one can imagine "inverted" (mechanical) computer mouse, is carried out their electronic positioning by moving the ball to the trackball than one. With the gyro sensor are movements which are performed with the device for mobile communication, received and stored by the computer in a memory. The data obtained are recognized on the basis of a method for handwriting recognition. Firstly, the user's signature can be verified, on the other hand it is possible that the user performs handwriting input, which are reacted by the method of handwriting recognition into executable commands for the device for mobile communication. An example is the handwritten input of phone numbers that can be used by the apparatus for mobile communication directly to the establishment of a connection. An apparatus for mobile communication in the form of a pin, so may be a small display unit in the pen give information about the handwritten recognized characters. Based handwriting recognition handwritten predetermined commands can be transmitted to the apparatus for mobile communication by the user performs a handwriting input 4, which corresponds to a predetermined input command that causes the device to a predetermined action. Examples of such predetermined actions are adjusting the volume or pitch of the Kling one or programming optional parameter (lighting, standby time, etc.). It is another further that a second sensor is provided which is set up such that the first sensor is activated by actuation of the second sensor. Here, the second sensor may be a pressure sensor which indicates when operated, that the first sensor has now expect a handwritten input. The second sensor can be designed as a button which is pressed by the user when the user wants to make an entry. The second sensor may be a coupled to the first sensor pushbuttons, thereby ensuring that upon actuation of the first sensor by pressing on a surface (and thus marking the start of a handwritten input) starts the handwriting recognition and is interrupted when the pushbutton no longer is closed. In the context of an additional development, a means of authentication of the user is provided, which means is arranged such that the font of a predetermined pattern, and determining .a similarity measure, wherein the user is authenticated, if the similarity is smaller than a predetermined threshold value, or the user is not authenticated if the 5 similarity is not smaller than the predetermined threshold. Another development is that the first sensor is disposed on a pen-shaped input device and the second sensor may be disposed in this pin-shaped input device, whereby in particular the pin-shaped input device is provided in addition to the apparatus for mobile communication. exchanging communication messages. The pin-shaped input device allows handwritten input, be it for authentication of the user, for entering telephone numbers, data (addresses, appointments) commands or notes which notes are stored either before or after handwriting recognition, the apparatus for mobile communication. Generally, it is possible to perform ny type of data entry via handwritten input, wherein preferably the handwritten input by a handwriting recognition in a computer readable format, for example ASCII code, is implemented. However, even without the handwriting recognition is a saving of the handwritten input possible (for example as a bit mapped graphics, ie in the form of individual pixels). So it is may not always be necessary to identify the content of the handwritten input: one Sent example, a fax using the device for mobile communication, it may be meaningless under circumstances which content has this fax, the possibility of data collection is important only (digitization) of the handwritten input and transmission by fax to a six addressees. In this way also sketches or diagrams can be transmitted to the addressee without their contents would have to be recognized only cumbersome. Embodiments of the invention are illustrated below based on the drawings and explained. Figure 4 is a block diagram illustrating possibilities for an input by means of movement sensor. Fig.l shows a device for mobile communication in stick form. The apparatus for mobile communication HDY is designed for easy operation by the user in stick form, wherein a sensor SENS, which is designed as a gyro sensor or as a trackball, the movement of the device HDY detected and to a computer (not shown) passes. On a display unit DISP strings or numbers are represented as they are detected by the method of handwriting recognition. the user is authenticated to the device HDY by entering his signature handwritten, 7 which signature is received by the gyro sensor SENS and examined by the computer, it is displayed on the display unit DISP whether the authentication was successful or not. An antenna ANT denotes a part of the transmitting and receiving unit of the apparatus for mobile communication HDY. Further, a key TAST, which is designed as a push-button (switch or alternatively as) arranged initiates the handwriting recognition by, as soon as the TAST key is pressed, activates the sensor SENS. Alternatively, the sensor SENS may be performed in addition to a pressure sensor, so that is detected during pressing of the sensor SENS on a surface that now a handwritten input is performed while an inactive pressure sensor indicating that the pen is in the air above the surface. In some methods, handwriting recognition is a subdivision of writing in solid lines on a surface (tray stroke) and lines above the surface (short-stroke), both types of lines are indicative of almost any handwriting important. The sensor SENS preferably has a proper writing tip is written with the same time for receiving the movement on the substrate. This is important for the acceptance of the user, since the size of the font can be better ensured by visual feedback and recognition is facilitated. In addition, the user sees its input and can, if repair or discard the entry. To enter the phone number to be dialed, only the name of the addressee is alternatively entered by hand. The associated phone number is automatically determined by the computer by name and selected. 9 blocks 402-408 illustrated. Block 402 indicates the input of the signature, by means of which the user is authenticated to the device for mobile communication. By the handwritten input of telephone numbers (s. Block 403), the keyboard to enter the phone number by the pen that writes the phone number, replaced. The device is preferably programmed by handwritten input of telephone numbers. With the telephone numbers associated data (addresses, appointments) will be communicated by handwritten input of the device for mobile communication (see. Block 404). Commands relating to options or functions of the mobile phone, will be communicated this mobile phone through handwriting input (see. Block 405). Also, notes that can be made intuitively by hand, of the apparatus for mobile communication is detected (see FIG. Block 406). For the transmission of short messages (English technical term. Short Message Service, SMS), the handwriting input also (. See block 407) is suitable. the handwritten input as a fax (see FIG. block 408) is preferred to be sent to an addressee. It does not matter in particular to be recognized content of the handwritten input to, but the handwriting is transparent, ie, transmitted to the addressee by fax without consideration of the content. 1. 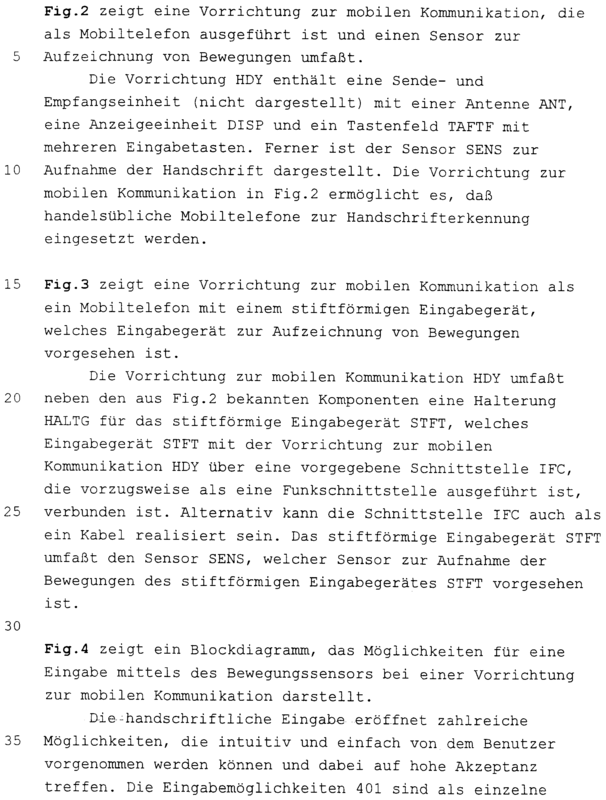 A device for mobile communication, a) having a transmitting and receiving unit for Durchf├╝hrung mobile communications, b) a first sensor for receiving durchgef├╝hrten with the apparatus movements, c) having a processor unit for storing and further processing the durchgef├╝hrten with the device movements. 2. Device according to claim 1, wherein the first sensor is a gyro sensor or a trackball. Device according to claim 1 or 2, wherein a second sensor is provided which is set up such da├ƒ is activated by Bet├ñtigung of the second sensor, the first sensor. Device according to claim 3, wherein the second sensor is a pressure sensor. 5. Apparatus according to claim 3, wherein the second sensor is a switch or a push button. 8. Device according to one of the preceding Anspr├╝che, wherein the first sensor is arranged on a stiftf├╢rmigen Eingabeger├ñt. 9. The device of claim 8, wherein the second sensor is arranged on the stiftf├╢rmigen Eingabeger├ñt.